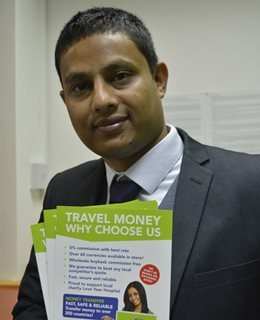 The new shop ‘Worthing FX’ is in Montague Street, Worthing, and Mohammad has ambitions to open more outlets throughout Sussex and the South East. He gained his MSc in Accounting from the university and an Association of Charted Certified Accounting qualification earlier this year. Mohammad said: “The university course materials, teaching quality and the student facilities enabled me to gain in depth knowledge of the UK’s financial industry. That encouraged me and gave me confidence to establish a business in the UK. 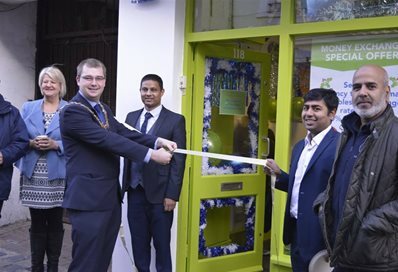 Mayor of Worthing, Alex Harman, opened the shop. Mohammad is in the centre. Mohammad was supported by beepurple, the university’s enterprise programme for entrepreneurial students and graduates, a scheme funded by Santander Universities. Clare Griffiths, the university’s Business Development Manager (Entrepreneurship), said: “We are delighted to see Mohammad launch Worthing FX and are confident he will grow a very successful and valuable business. Tagged ACCA, Accounting, alumni, Business, Careers, Entrepreneurship, Start-up. Bookmark the permalink.